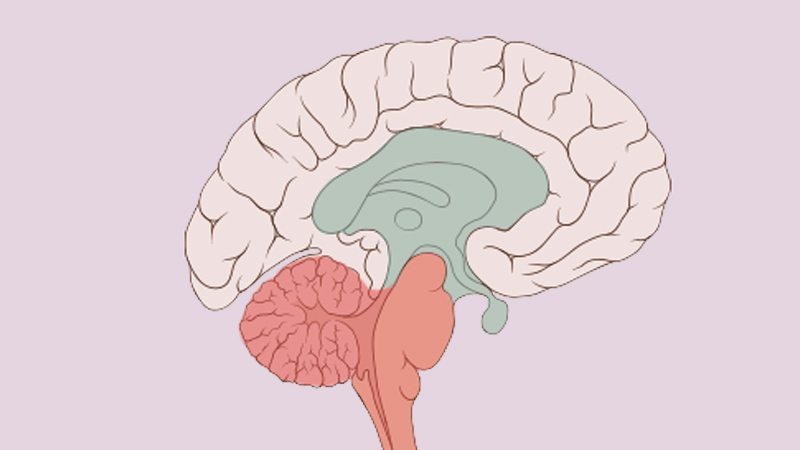 The old primitive brain is shown in blue and red: the limbic system, brain stem and cerebellum. Where are memories stored? In order to heal trauma, how important is it to remember what happened? These are common questions that often come up working with clients and teaching on trauma. There are folklore phrases such as ‘muscle memory’ and ‘cellular memory’ that can be very useful but need to be applied carefully. They speak to the importance of information stored in the body. However it is essential to understand that for the information to be available to our awareness, our brain needs to be involved in processing the patterns of information flow happening in the body. Where the information is processed – in the primitive brain (unconscious) or in the cortex (conscious) – determines whether or not the memory is explicit. I have a favourite old pair of jeans right now, some holes are on the second round of stitching. The wrinkles and folds in the material are a memory of sorts, the jeans mould to my body like no other pair of trousers. The fascia researcher Gil Hedley (2005) talks about fascia as ‘fuzz’. The fuzz accumulates and represents time. A certain stickiness and alignment of the fibres in the tissues holds the joints in more habitual ways. Imagine a small child being shouted out by her father. Her shoulders tense, her neck tightens and there is a surge of fear related hormones and activity in the body. If this happens continuously the pattern of ‘shoulders tense and neck tight’ becomes a deep ‘action pattern’ (Kozlowska et al 2015). Now imagine 30 years later the adult is on your treatment table. With grounded presence and soft, safe, warm, hands you are holding her head and neck. The tissues in her neck begin to express long held contractions and tightness. A shape in her body emerges, similar to the pattern generated when she got shouted at. Your client begins to feel unease and may think about her father. The ‘muscle memory’ is the tension and tone in the tensegrity of the neck (Ingber 2008). The ‘cellular memory’ is cellular membrane receptors on local and global cells that grew to be sensitive to the all the stress hormones, immune system signaling and inflammatory chemicals that used to be secreted in the fear response (Damasio and Carvalho 2013). The ‘action patterns’ are simple, default movement schemas held in the old primitive brain. Sensory nerves signal the changes in tension and chemical milieu to the brain. Only with the brain involved do we have emotions, feelings and thoughts generated in awareness. They may or may not be fully integrated into cognition, but something is happening. A memory is being expressed. Instead of explicit memories we can have implicit memories (I first heard this term from Babette Rothschild, 2000), here the activation is chiefly in the primitive brain (brain stem, cerebellum and limbic system). The client on the table becomes scared when you touch her neck and too much changes too soon, but she does not really know why she is getting upset. We can then help find the right pace of change for the individual so they can learn to self-regulate. The therapist’s skillful presence can lead to co-regulation such that the individual can learn to self-regulate (Ndefo 2015). The primitive brain does not do words and concepts very well, but will respond to safety, touch and presence. Implicit memories are coded very simply in the primitive brain. Often they are without a timeline. The amygdala – an important part of our threat detection system (LeDoux 2015) – holds lots of symbolic representations of threat. The amygdala will trigger ‘fight-or-flight’ or ‘immobility’ responses (‘defense cascade’ Kozlowska et al 2015) if it senses danger in the incoming information stream. If the cortex gets involved then we will have explicit memory – we can pull in associated events and a timeline to contextualise the activity in the body. Explicit memories usually only emerge into awareness after the body has changed. The hippocampus and prefrontal cortex should help us say ‘That happened 30 years ago’. The skill of the therapist here is to honor the memories and stories that appear but keep orienting the client to resources in the body and environment; ‘Its not happening now’, even if your body is screaming at you be scared. Following Dr David Berceli (2008), founder of Trauma Releasing Exercises (TRE), I am fond of saying ‘You do not need to remember or do not need to understand to heal trauma’. The goal is to overwrite the symbols in the amygdala with present time information. The body is a great source of good news that can bring you into now. Information is stored in the tissues and cells of the body. The threat detection systems in the primitive brain can be activated as the body changes. The primitive brain does not do words and concepts very well, but will respond to safety, touch and presence. If we can support change in the body and down regulate arousal we can change memories with out needing to understand or remember the trauma event. The goal is to uncouple the charge of the defense cascade from the sensations of the implicit memory. 1 Kozlowska et al (2015) list some early signs of arousal. For flight-or-fight (their preferred order of this phrase) they list; changes in breath, furrowing of the eyebrows, the tensing of the jaw, or the clenching of a fist, narrowing of the range of attention. For immobility states they list; visual blurring, sweating, nausea, warmth, light-headedness, and fatigue. My favourite signs to look out for are anything going too quick (thoughts, sensations or emotions that cannot be integrated into the present moment) and anything going too slow (spacey, floaty, absence, hard to make eye contact, numbness or tingling or loss of body awareness). Dry mouth, sense of small or far away feet, absent belly, cold hands and a sense of someone withdrawing are all good signs to put the brakes on, whatever process is being expressed. David Berceli teaches ‘Freezing, Flooding or Dissociation’ as signs that too much arousal is occurring. Berceli D (2008) The Revolutionary Trauma Release Process. Transcend Your Toughest Times. Vancouver: Namaste Publishing. Damasio A and Carvalho GB (2013) The nature of feelings: evolutionary and neurobiological origins. 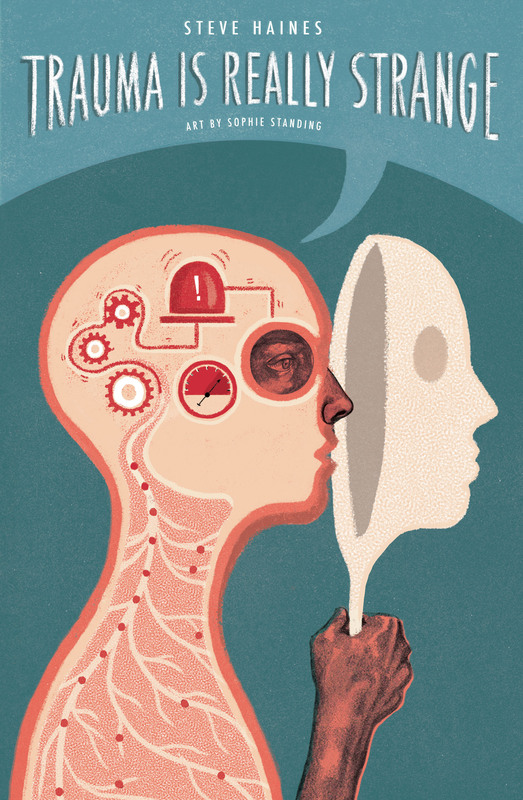 Nature Reviews Neuroscience, Vol 14, February 2013, 143. Hedley G (2005) The Integral Anatomy Series. 4 Vol DVD set. Integral Anatomy Productions, LLC, 430 Westwood Avenue, Westwood, NJ 07675, USA (or check ‘The Fuzz Speech’ on YouTube). Ingber DE (2008) Tensegrity and mechanotransduction. Journal of Bodywork and Movement Therapies 12, 198–200. Kozlowska K, Walker P, McLean L, and Carrive P (2015) Fear and the Defense Cascade: Clinical Implications and Management. Harv Rev Psychiatry. 2015 Jul; 23(4): 263–287. Ndefo N (2015) Personal communication. www.trelosangeles.com ‘Sometimes we have to co-regulate before we can self-regulate’. Rothschild B (2000) The Body Remembers – The Psychophysiology of Trauma and Trauma Treatment. London: W.W. Norton. An extremely useful skill is to learn to perceive the whole of your body. This is not a given. Close your eyes right now – how big or small do your feet feel? Are you sure they feel really clear and present? Keep practicing your subjective experience of simple things such as the size, shape and weight. It may take a while until these qualities becomes easily available. Try to work through the Weight-Outline-Skin-Inside ‘WOSI’ sequence below. Can you really inhabit the whole of your body space? The boundary of the skin helps differentiate who we are. Our skin is a transition place between me and not me. We can engage with the skin as an outpost of the nervous system. It is a very powerful to come into relationship with your skin and take up occupancy in the whole space of your body. Frequently there will be bits missing in our awareness: ‘My feel feel really small and far away’, ‘One leg is heavier and bigger’, ‘My abdomen feels absent and empty’, ‘I am floating’, ‘I think it feels ok’. The last one is always a challenge. You think you have a body? You are the expert on what it feels like to be you. Try to make definitive statements, generally simple descriptive words work best. What is the difference between knowing you have a body and thinking? Commit to what you perceive, let yourself use metaphors (‘fluffy white rabbits’ was one memorable description) and swap the verb from thinking to feeling. Feeling is such a wonderful word in that it speaks of sensation but also emotional tone. Let both be present in your awareness. What is your response to feeling the nuances of your body? It can be intense, so go slowly, but do keep trying. 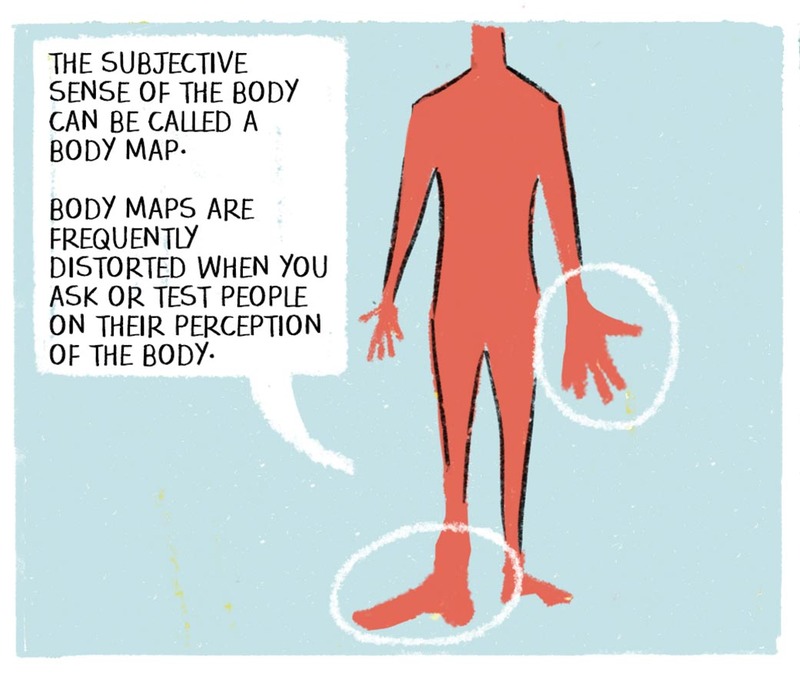 If your map of your body is inaccurate it will be very hard for your brain to control your body. This is the root of many pain conditions. Below are some sample questions that can help you draw out your sense of your body. Initially it can be useful to go through them as a sequence when lying down and using the mnemonic WOSI; Weight, Outline, Skin, Inside. With more experience you can be much more flexible. Often the simple question ‘how does x compare to y’ can open up a realisation of an incomplete mapping of the body. Our ability to accurately map out our body is an essential feature of health. The brain needs accurate information about the body to be able to control the body. In my clinical practice, people reporting distorted body images are very common. Helping people be safe enough and skilled enough to feel the slow background tone of the body is often the first thing I work on in helping people change their pain experience. Feet are often hard to feel and the belly is frequently absent. Simple things like the weight, outline, skin and inside feel of the body are surprisingly hard to orient to. I tend to describe the failure to inhabit the body as dissociation. There are a whole continuum of responses, from complete withdrawal/ catatonia (this is what the psychiatrists focus on) to the inability to feel your toes. Frequently in cranial work I notice people are working from incomplete body maps, for example often a limb is missing or there is a big hole in the belly. I strongly relate fragmented body maps to the experience of chronic pain – when people can map the whole of their body effectively and safely then the pain nearly always goes. There is some amazing new writing and research on pain and body ownership around at the moment. Petkova VI, Ehrsson HH (2008) If I Were You: Perceptual Illusion of Body Swapping. PLoS ONE 3(12): e3832. This is great book on body maps that discusses in detail how plastic our body maps are and how we have a multitude of ways of inhabiting our body. The video below is another wonderful development of how pain works. There is a revolution in how researchers are framing pain over the last few years. As teachers in the cranial community we are trying hard to catch up. We have changed our essential reading list to include Painful Yarns by Lorimer Moseley and tweaked the Body Intelligence Training manuals and teaching to reflect these new understandings. The good news is that much of the territory we have been exploring for many years. The video below gives some great science backing up the model of using WOSI (Weight Outline Skin and Inside) as a framework of exploring how people actually perceive their body and our general goal of being embodied. The research on two point discrimination described about half way through is fabulous. Also the left right discrimination. In fact the whole thing is just great.